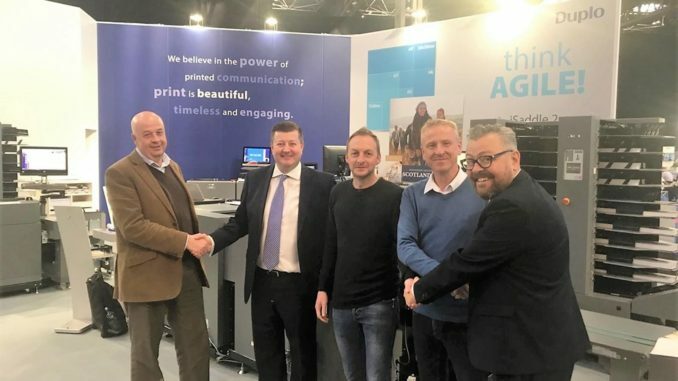 Having enjoyed a solid working relationship for eight years, Duplo and Epic Print are partnering up once again. Duplo will supply Epic Print with an iSaddle 2 system, which will slash traditional processes and provide full automation. This will free up time for senior technicians, and enable the company to more effectively deal with its four-fold increase in work orders. Epic operates across a broad spectrum of quality print for both the secondary packaging and marketing communication sectors. It employs 26 people and has a turnover of £2.5m, and Duplo’s iSaddle 2 system will hugely improve Epic’s output for its marketing services work. Managing director, Mark Downey, said: “Epic has enjoyed a strong relationship with Duplo over the last eight years and has a deep confidence in both its innovation and engineering reliability. “The decision to move from traditional saddle binders was not taken lightly. However, the drive for quicker make readies through the impressive automation available on the machine, made a compelling case for the investment. We expect to make a massive improvement in efficiency and the comprehensive tests that were carried out, indicated that the iSaddle out-performs the current in-house traditional approach to fold, gather and stitch, even in the longer run arena. Jason Davies, regional sales manager for Duplo UK, said: “Shorter runs are a fact of life in today’s print industry, so companies likre Epic are recognising the need to combine saddle technology with our intelligent automated precision feature, running from flat sheet, as opposed to folded sections.